← Why Go White Water Rafting? Many surfers based in the UK are often clueless when it comes to finding a good beach to catch a few waves. The UK is often mistaken for a place where surfing isn’t really possible; however this is most certainly not the case! By picking the right time of year to hunt waves (usually autumn) and finding a well situated beach, you can hit some extreme waves. This North-Yorkshire spot is a well-respected surfing zone and the hotspot to surfing when it first became popular in Britain. Waiting for the right time for the tide here and in fact anywhere is vital to being able to find the biggest waves. When the tide is in, you will very rapidly notice that the sea is filling up and many locals have the same idea as you. Saltburn is also a great place for any beginner surfers to catch some smaller, tamer waves to practice on. These can be found either side of the pier. On top of all of this, there is some renowned surf shops nearby which sell some of the best boards and equipment available. Llangennith is known as the most popular surfing spot in Wales stretching three miles long. When a nice swell is running and tide is in, the beaches become flooded in places with fellow surfers. If you are looking for a quieter surf, there are breaks in the sea where you shouldn’t have to worry about other surfers taking your waves, in order to do this though, you must be prepared to take your time in walking along the beach. The single down side to this spot is that it can become exhausting when paddling out line after line of white water. Rips are also something to keep an eye out for. These places usually pick up a lot more swell than other Devon beaches and has many different peaks depending on the tide. This isn’t commonly a place where tourism thrives, allowing for problem free and quiet surf. Usually, you can get a lengthy, smooth ride here especially when using a longboard. Beware of the rip on the east side of the beach however. Personally, this is my favorite place to visit for surf due to the immense power you can get off the waves (when timed correctly) and the low rates of tourism. Freshwater consists of a huge beach with many rips running continuously along it. This is great as it means you can usually find a set of waves to yourself and not have to worry about sharing them with everyone else. The main part of the beach usually produces some great and often very large breaks. There are also some incredible breaks in the smaller sized bays more towards the south. 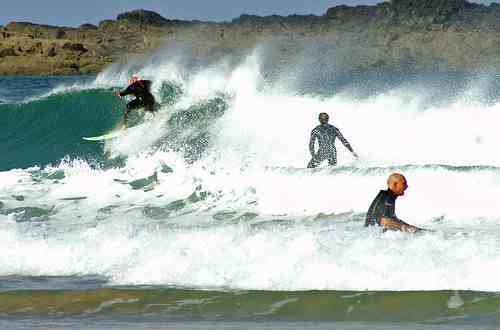 Fresh also holds home to one of the best reef breaks in Wales, and ultimately the UK. It should be noted though that a military firing range is situated just above some of the cliffs and if caught surfing nearby without permission, you could face prosecution. This entry was posted in Europe, Surfing, Travel, Water Sports and tagged Surfing, UK. Bookmark the permalink.